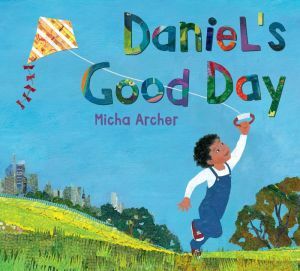 Daniel finds the poetry in the everyday activities of his own neighborhood, in this gorgeous companion to Ezra Jack Keats Award winner Daniel Finds a Poem. The people in Daniel's neighborhood always say, "Have a good day!" But what exactly is a good day? Daniel is determined to find out, and as he strolls through his neighborhood, he finds a wonderful world full of answers as varied as his neighbors. For Emma, a good day means a strong wind for kite flying. For the bus driver, a good day means pleases and thank-yous. A good day is bees for the gardener, birthdays for the baker, and wagging tails for the mail carrier. And, for Daniel's grandma, a good day is a hug from Daniel! And when Daniel puts all these good days together, they make a lovely poem full of his neighbors' favorite things. Micha Archer's vivid collages bring to life one special day, and her inviting text celebrates a vibrant community and an appreciation for the many simple things that give us joy.